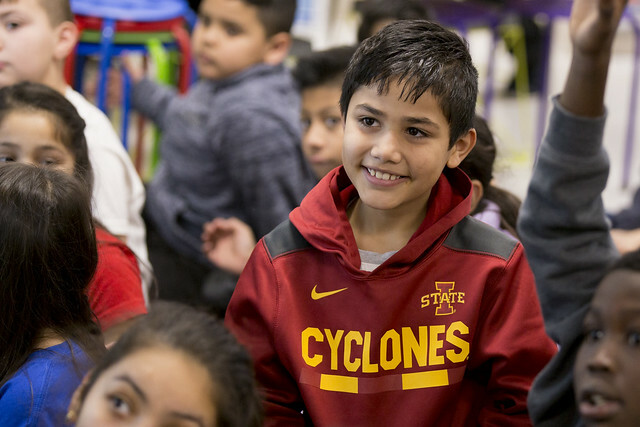 That’s a paraphrased excerpt from the University of Iowa fight song that might be looping in the heads of 4th graders at Capitol View Elementary after a special lesson on Tuesday afternoon. Fourth grade, aka The Class of 2026 according to the Capitol View hoodies many of them were wearing, is wrapping up a social studies unit about the state of Iowa. To cap it off the 4th grade teaching team came up with the idea of Iowa College Day. Students gathered for a PowerPoint presentation, compiled a list of state colleges and universities, found out their teachers’ alma maters and declared their own preliminary choices and major areas of study. They even got their pictures taken sporting the colors of the school they see themselves attending after they graduate from high school in eight short, quick years. No worries. Schott, an Iowa grad, handled the future Hawkeyes in Dodd’s classroom. Melanie Burdick, a UNI alum, headquartered the prospective (and purple) Panthers and both Emily Case and Kelli Bosch repped for their beloved ISU Cyclones. None of the three state schools got shut out when the students made their selections. Planned areas of study ranged from YouTube at UNI to Service at the U of I. There are bound to be tweaks between now and ’26. But the seeds are in the ground. That’s enough for now. “The word is fight, fight, fight for Iowa…” Or someplace else if you prefer. Just don’t stop after high school. Right, Tigers?